One of the things that makes me so sad is the way that my generation has become so throw away. Clothes, toys, materials etc… of course it’s made even worse for the world with the number of plastics and man-made materials in this. My kids have picked up on this and we will often go on a drive and they will become increasingly annoyed by the amount of rubbish on the side of the road. They are sad when they see the films of marine animals caught in the nets, killed by plastics in their stomach and the seas of plastics in the ocean. 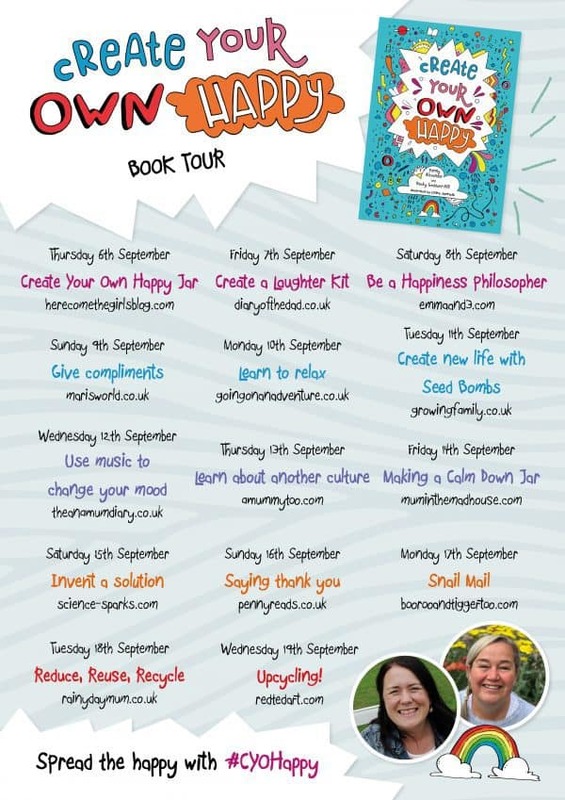 In the new book Create your Own Happy by Penny Alexander and Becky Goddard-Hill one of the chapters that is by far mine and the kids favourite is “Making the World Happy”. The activity we share here is one of the ideas from the book with my kid’s interpretation of it and the ideas and talk it spurred. Inspired by this junk model activity for kids check out all of our Recycled Materials and Junk Model Crafts here on Rainy Day Mum. 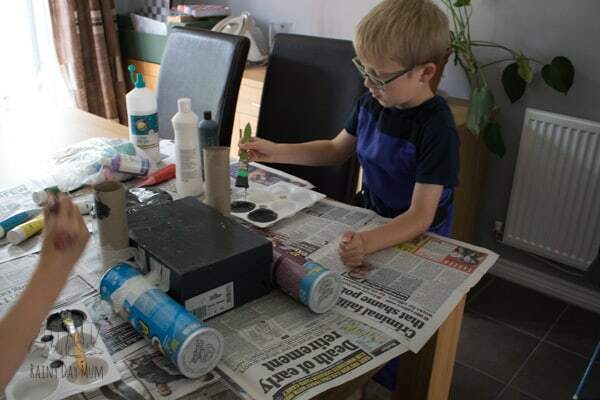 If your home is anything like ours then we try out best to recycle as much as possible. We have a box where throughout the day anything that can go out to be recycled does. We also have a large bag of stuff that can be reused like old jeans to make into aprons for crafting, handing down clothes to younger friends and donating to charity. 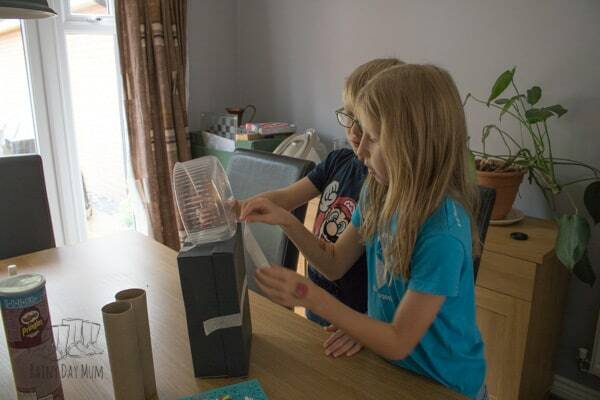 The kids are very aware of this although one of their favourites is to raid this box and get creative. 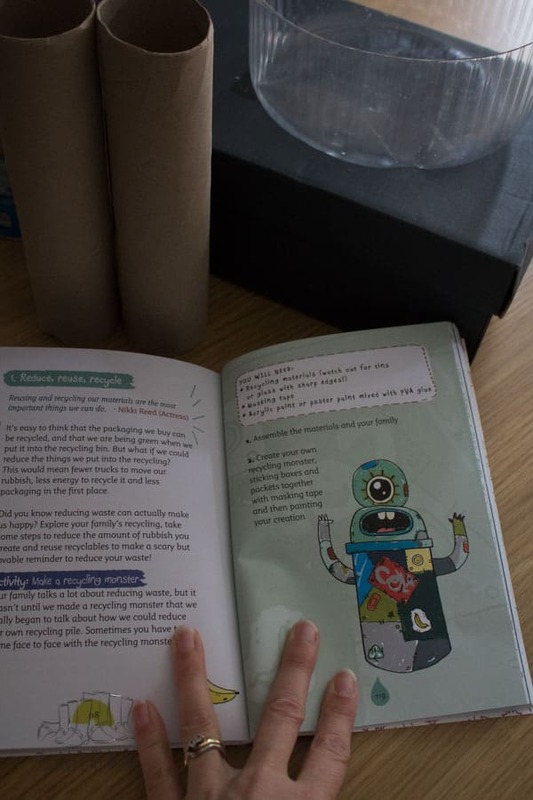 The Recycling Monster is just one of the activities and their favourite. You don’t need much and it’s so open-ended that you can let their creativity flow. 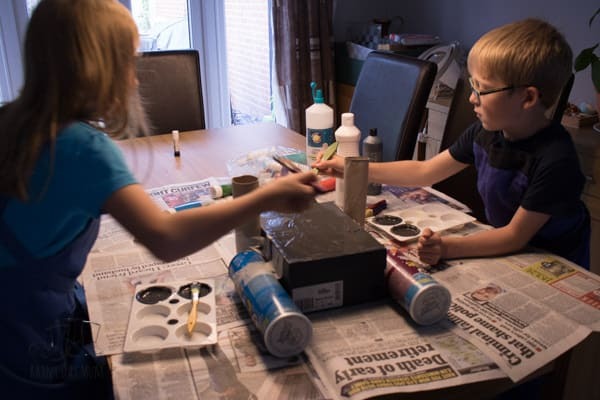 Paint – if you are just using cardboard then I found Ready Mixed paint was fine to use, however with painting on plastic I needed to use Acrylics. 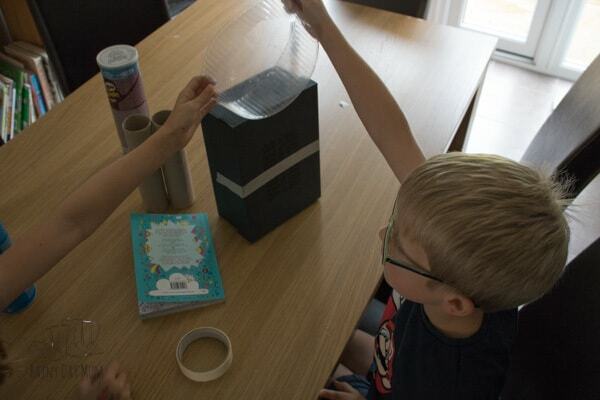 This is the fun bit – there are no real instructions. If your kids want a monster with 5 arms then do it. 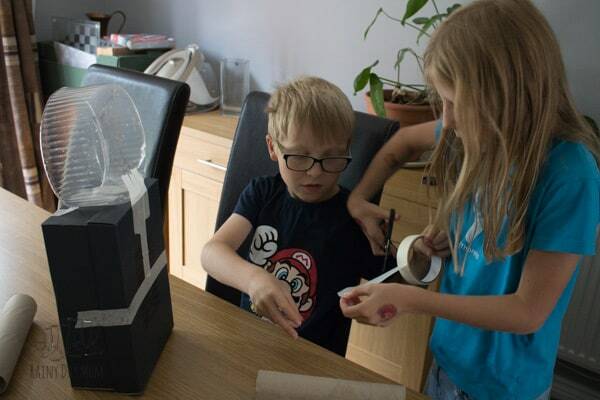 Mine had very clear ideas they worked together (a miracle) and then they solved the problems like the masking tape not holding on the arms properly by figuring out that my hot glue gun would work better. 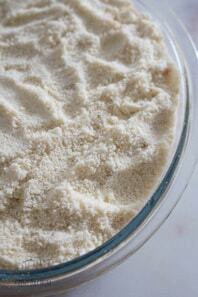 The tips – attach it together FIRST. 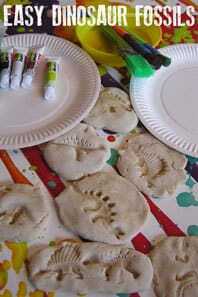 Then paint, paint on LOTS of newspaper or a wipe down surface as it did get very messy. Leave one side to dry and then do the other side. Add extra’s after you’ve painted it all. The book is called Create your Own Happy. It’s aimed at children between 7 and 11 (so Key Stage 2 in the UK). But, the whole idea resonates with me so much more. Back in 2011, my life wasn’t what I expected it to be when I had envisaged my family life. I was suddenly a Stay at Home Mum, something that had never ever been part of what I wanted in my life prior to kids. But then, they came and the way that I saw things flipped. I know that I had to work on creating my own happiness in this new situation. I set goals. The first goal for me was to do something with the kids every day, I did what I knew I enjoyed which made me happy and that was getting creative and doing an activity. 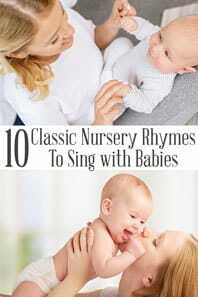 I went from disliking the life I had chosen to love it and at the same time, Rainy Day Mum was born. I Created my Own Happy as an adult. Getting the kids to look at this we spent time discussing the planet, they asked questions of me about what I had done to “Make the planet happy”, we spent time together filling our own jar with happy memories. When we need our happiness jar filling more, a bad day at school, work not going right for me like all the tech failing we can return to it. We can spend more time together, the kids can create their monster recycling robot, we can talk more about the things that I did prior to them coming and meeting Rainy Day Dad. We can discuss what they as mini eco-warriors can do to make a difference. As the book says. One little flap of a butterflies wing somewhere in the world could cause a tornado across the ocean. It’s the butterfly effect… maybe the 3 pieces of rubbish they pick up on their next walk along the beach would have been destined for the stomach of one of the few remaining individuals of an endangered species and that pick up stopped that animal dying. Or maybe someone else saw them do it, asked about it and started to do it themselves and it caused as a chain reaction. A movement a difference. But, if not that then we’ve filled our happiness jar and before it gets to the level where it’s hard to fill again the knocks won’t have as big an effect as when the jar isn’t as empty. We have included a link to the book. If you buy via our link then we may earn a small commission. 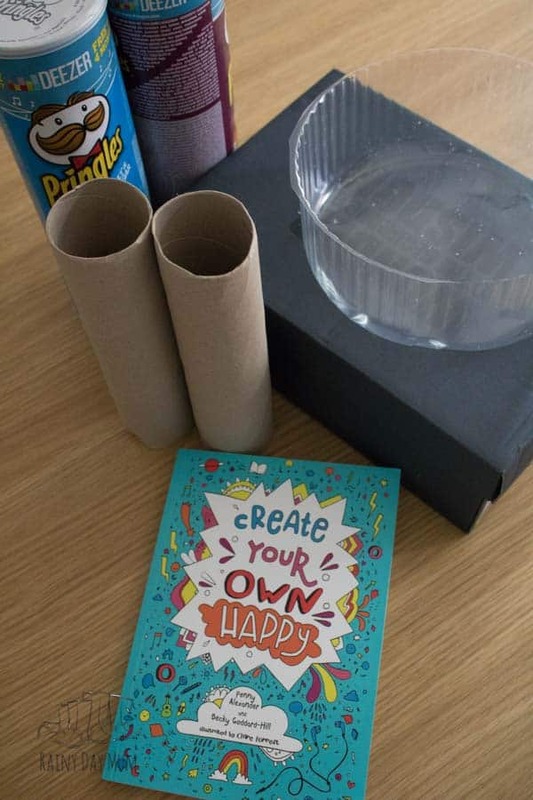 Create Your Own Happy by Penny Alexander and Becky Goddard-Hill is a great book for kids from 7 – 11 although there is no reason why as a parent you couldn’t use it as inspiration for ideas with younger children. But… it’s not aimed at us as parents using it really. 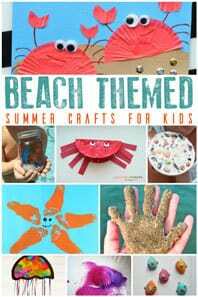 It’s for the kids, it’s an activity book which is full of fun illustrations, easy to follow instructions for all of the activities plus the science bit. 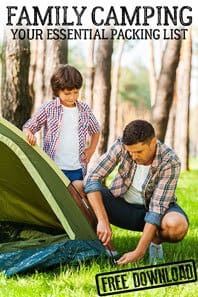 It’s not just 50 activities that will make your kids happier because they are fun. It talks about the reason why it makes a difference, what makes us happy and how we can use that knowledge to make others happy too. In a world where kids are put under more and more pressure through schools, the way that we interact with less face to face time and more “Facetime” and social media means that depression and anxiety are on a rapid rise with kids. A friend of mine caught me sharing this book over on Instagram and messaged me immediately asking about it. In her words, it was exactly what her daughter needed. A daughter, that is the same age as my eldest but has been in and out of hospital most of her life due to a brain tumour. The activities, the science, the why behind it, the colours, the fun illustrations were exactly what she needed. 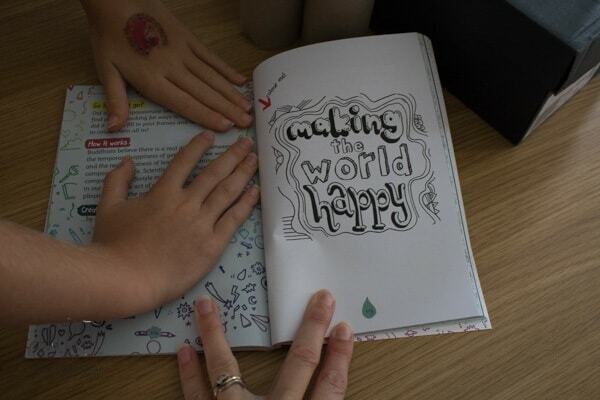 You can get Create Your Own Happy on Amazon or in other bookshops. 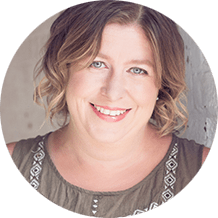 Because not only do we LOVE the book but I’m also friends with Becky and Penny we have joined in as part of a Blog Tour for the book. 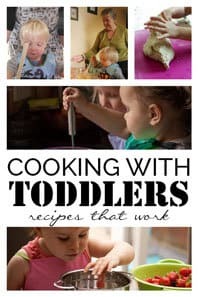 Check out the other ideas from the book below if you aren’t convinced it would make a fantastic addition to your kids activity books this year. Yesterday you can find an Activity from the book Over on Boo Roo and Tigger Too all about sending SNAIL MAIL! Head over there and you can enter a giveaway. Next is Upcycling over on Red Ted Art. 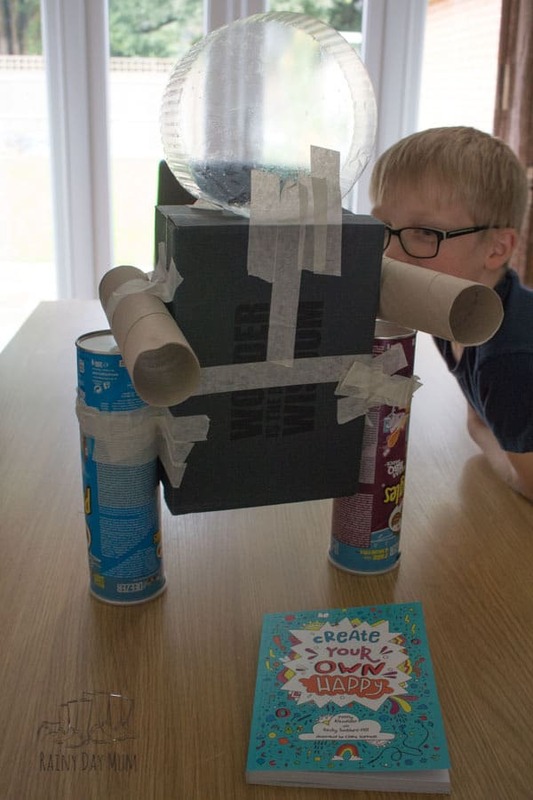 Oh, I love how you have used this activity to get your kids all curious and I just absolutely adore their robot. Thankyou Cerys and well done kids! Thank you so much for your support and wonderful insight into the activities in your house! 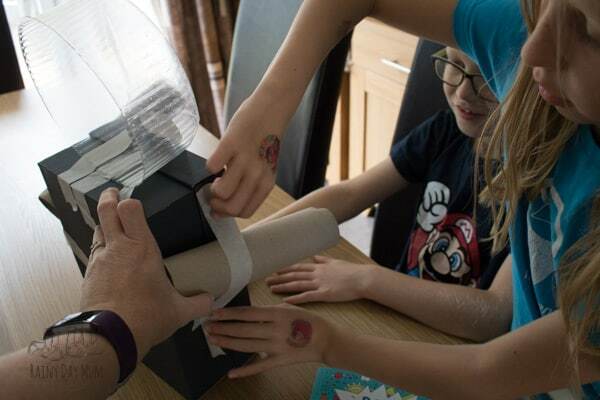 I love how you changed your happiness, that’s really inspired me – we brought some lovely games back from Blog On at the weekend and I am now thinking a game slot would be lovely now mine are older! Love the kids’ creativity. Wishing you lots of happy!